The New York Times online paywall officially goes up Monday around 2 p.m. Eastern. After that you'll have to pay at least $3.75 per week for unlimited access to the site. The paper is hoping to attract new subscribers by offering the first 4 weeks of any digital-only subscription for 99 cents. After the introductory period, digital subscriptions cost $15-$35 every four weeks depending on the subscription you choose. Before you dive in and start paying for a digital subscription, however, keep in mind there are a few ways to get online access at a cheaper rate. Here's a breakdown of all your options. The cheapest way to get access to the online version of the Times is to sign up for a Sunday-only or Monday-to-Friday home delivery subscription. All subscribers to the paper version of the Times automatically get the "All Digital Access" package for free. This means, in addition to the paper version, you get unlimited access to the Times online through its iPhone, Blackberry and Android smartphone apps, the iPad app, the Web app available through Google's Chrome Web store, Times Reader 2.0 and NYTimes.com. All Digital Access does not include e-reader subscriptions such as the Kindle or Nook or the Times' crossword apps. Here are the current U.S. subscription prices for home delivery for most readers outside of New York City. Once you are a home delivery subscriber you must connect your home subscription account to your NYTimes.com membership here to get the All Digital Access package for free. Tip: New home delivery subscribers get their first 12 weeks at 50 percent off the regular price. Introductory rates are only available to you if you have not had an active home delivery subscription in the past 90 days. Bonus Tip: The New York Times home delivery service is not available in Alaska, Hawaii, Puerto Rico as well as some areas of the continental U.S. You can check availability in your area here. If you are not interested in getting home delivery, you can subscribe to the digital version of the paper based on the type of device you want to use. The best value for you depends on which type of digital access you want to have. If you're looking for access on every device imaginable then you can save between $65 and $70 per year by getting Monday-to-Friday or Sunday-only home delivery--if available in your area. If you are only interested in getting access on your iPad or on Times Reader then it's best to go with the $5-per-week digital option. 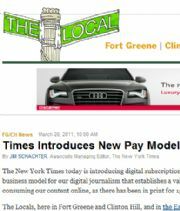 TIP: As mentioned earlier, right now the Times is offering the first 4 weeks of a digital subscription for just $0.99. Bonus Tip: Digital and home delivery subscribers get access to 100 articles per month from the Times' historical archives spanning 1923-1986. Subscribers have unlimited access to articles written after 1986. If paying for a subscription to the Times doesn't interest you, then you can still get limited access to the paper's digital products. Visitors to NYTimes.com get free access to 20 articles per month. As you get closer to your 20-article limit you will start to see pop-ups counting down your free access. The 20-article allowance is renewed on the first of every month. It's unclear if that means your limit will renew on April 1, 2011. After 20 articles, you can view the site's home page and section home pages such as the landing page for Sports, Opinion or Politics. The Times says you can "browse" these pages, but it's not clear if you will be able to read the content for free after you've accessed your allotment of 20 articles. If you are using Times Reader or the mobile app for your iPad or smartphone you will get unlimited access to the 'Top Stories' section but nothing else. There is also a loophole that lets you read more than your monthly allotment of 20 articles if you follow a link from a social network such as Facebook or Twitter or from a third-party blog. The Times also lets you read another five articles per day if you follow links from most major search engines such as Google or Bing. Unlimited freeloading may be over, but with so much free news content available online it will be interesting to see if a large number of readers agree to pay for access to The New York Times.